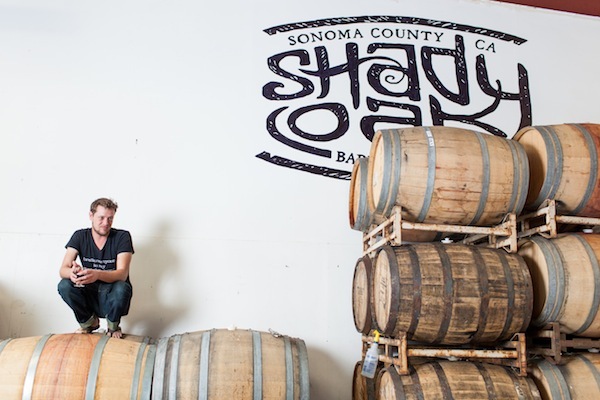 Barrel-aged sour beers are the only thing you’ll find at Shady Oak. Goonies, when Sean Astin tries to convince his friends to stay down in the pirate cave—to choose adventure and unpredictability over the known world above. “Up there, it’s their time!” he declares. “Down here, it’s our time.” It could be the stacks of old-looking wooden barrels that give the place a pirate ship vibe. Or maybe it’s the musty, funky, fruity smell of wild yeast running free. Whatever it is, head brewer and owner Steve Doty has got something unusual going on with his exclusive focus on the art of sour, barrel-aged farmhouse ales. The larger beer world is taking notice. Earlier this year, Doty, 34, was named one of the 10 best brewers in the world by RateBeer. Not bad for a guy who works out of a humble Santa Rosa warehouse off Piner Road, among beer-filled barrels with nary an ounce of stainless steel in site. Yet this isn’t a brewery, mind you. It’s a barrel house. Doty is clear on that distinction. Here, an active community of microflora takes center stage. clean and sterile, European brewers were always at the mercy of the wild yeasts and bacteria in the surrounding environment. The resulting beers, known as lambics, were acidic with a distinctive tart, layered character. Inspired by an ancient tradition and legendary Belgian breweries like Cantillon, American brewers started experimenting with sour beers a few years ago, often with poor results. But that’s changing, according to Doty. 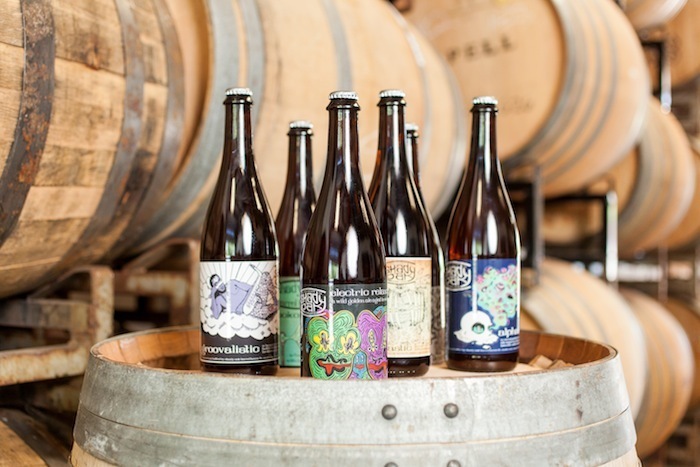 He points to Jester King Brewery in Texas and The Rare Barrel in Berkeley as breweries that are creating innovative, barrel-aged sour beers. At Shady Oak, Doty brews farmhouse ales. This particular style came about when farmers made beer with whatever they had on hand, whether wheat, rye barley, juniper berries, evergreen boughs, or bolted coriander plants. “A true farmhouse ale conveys a sense of origin; a great one, transcendence,” writes Phil Markowski in All About Beer. “You feel the rusticity, imagine the field and sense the unpredictability of the season—the liquid summation of terroir. Still, sour beer makers, in the North Bay at least, are a rare breed. Throw a stone in these parts and you’ll hit a local IPA. Throw a hundred stones and, if you’re lucky, you’ll hit a local barrel-aged sour. It’s a beer-making process that tends to scare people away. Some people (winemakers, abandon all hope ye who enter here) stay far away from brettanomyces, the wild yeast that grows on the skin of fruit, for the threat of off-flavors, a ruinous prospect for wine and most beers. What sets Doty apart from standard brewers is a mad scientist quality. After procuring professionally grown bacteria strains from labs, Doty cultivates them at home in flasks, beakers, and test tubes—Bootsy Collins and Maceo Parker playing in the background. The bacteria adds acidity to the sours. The chosen bacteria go on to live that second life in the barrel house. Though Doty uses a “clean” yeast for 90 percent of the fermentation process, he’ll add in certain brettanomyces and bacteria to the beer. Despite the element of unpredictability, he always designs with the end goal in mind. The wild yeast actually works in conjunction with the bacteria, which can emit weird smells and off-flavors. The beer ends up sitting in the barrels for months at a time. Doty comes through regularly to taste them, looking for certain characteristics and making notes on a spreadsheet of how they are coming along. The barrels themselves are strategically chosen for character. For example, a rye whiskey barrel from Heaven Hills will impart a sharp wood character. 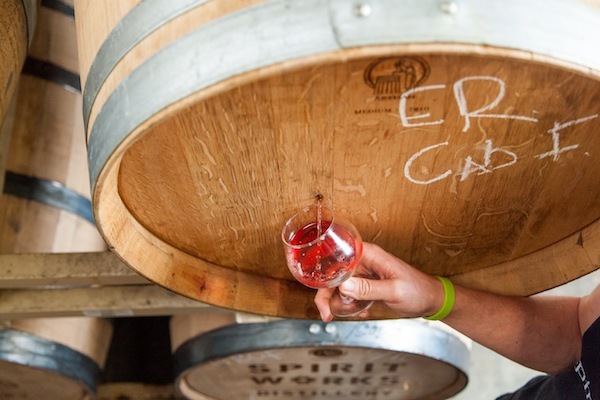 Gin barrels from Spirit Works Distillery will have a different effect. Depending on what he’s going for, Doty might add 75 pounds of Dry Creek cabernet franc grapes or peaches from local orchards to impart more fruit character. Ultimately, Doty’s passion lies in blending, a process he finds endlessly fascinating. It took six months to finalize the blend for Electric Relaxation, his June 2016 release. In search of a good balance of acidity, oak, and fruit, he tasted samples from one barrel after another, rating them according to quality. Once he’s satisfied with the results, he blends until he gets what he wants. It’s a method, he says, that involves more time, patience, and a willingness to experiment. “It’s done when it tells me it’s done,” he says. In other words, this beer isn’t on a quick turnaround schedule. Electric Relaxation was the first batch of beer to be barreled 18 months ago, when Shady Oak was in its infancy as a business. Now bottled, the beer will enter into a secondary fermentation, gaining complexity and personality. He may love sours now, but Doty didn’t start out brewing in the style. At the age of 16, he got his first home brew kit, and soon he was winning home-brewing awards for IPAs. Eventually, he went to work as a lab tech at two large Napa County wineries. His days were spent bent over microscopes, fermenting and identifying yeasts. He started blending, acquiring the ability to identify individual components in the wine. Despite seven-day work weeks, Doty brewed beer late into the night at home. 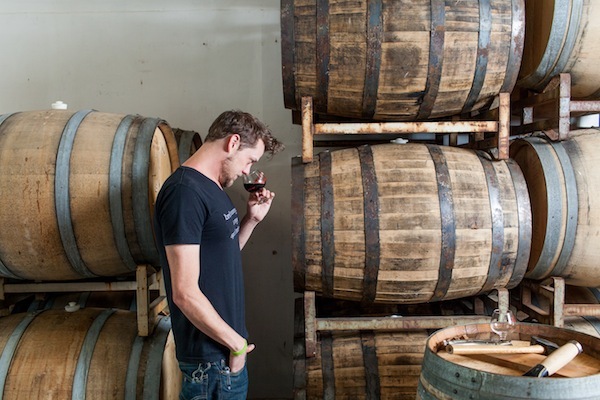 He delved into sour, barrel-aged beers, applying his knowledge of blending to his true love. Then he hit a low point in life triggered by a divorce, job dissatisfaction, and a degree in a field with few employment prospects. It was time to try to get a paycheck from his passion. 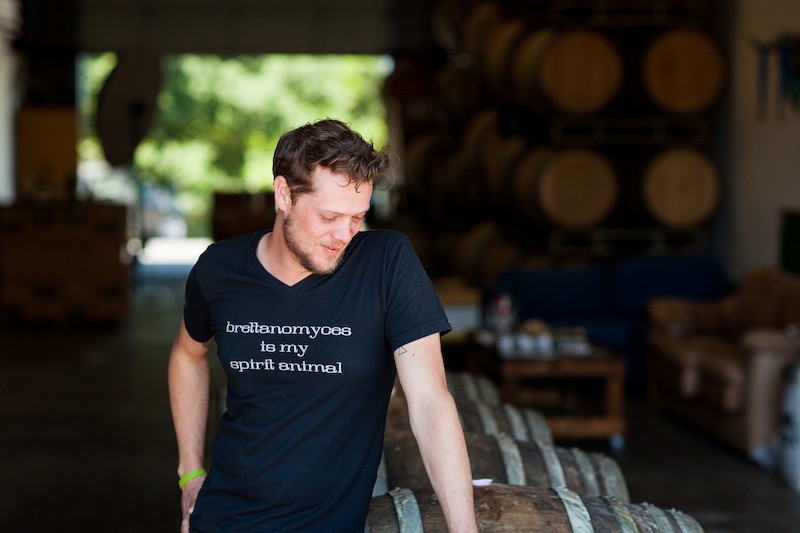 In 2012, he wrote up a business plan, and two years later, with the help of private investors, he launched Shady Oak Barrel House. Future plans include a tap or tasting room, but, for now, he’s happy to barrel and bottle beer to be shipped across the county, state, and country. The unpredictability of working with brettanomyces and other wild yeasts keeps Doty on his toes. More importantly, it keeps his dream job exciting. Look for Shady Oak Barrel House beers at Rincon Valley Tap Room & Bottle Shop, Oliver’s Markets, Wilibees, Brew, and other well-stocked bottle shops.